There are many ways to achieve customer service excellence. Professional customer service representatives who truly want to excel at their jobs find ways to acquire the knowledge and skills necessary to succeed. In many organizations professional development training and information are provided. These resources help employees gain the tools needed to provide stellar customer service and interact with a diverse variety of customers. If you find that you are not receiving the support you need, there are options that you should consider in order to ensure that you have the information, skills, and support to achieve customer service excellence. The following are three strategies for professional development that can help. Strive for improvement. Customer service can be frustrating and, in some instances, monotonous. You may need to create self-motivation strategies and continue to seek fulfillment or satisfaction. By remaining optimistic and projecting a can-do image that makes customers enjoy dealing with you, you can influence yourself and others. Smile as an outward gesture of your “I care” philosophy. Many self-help publications and courses are available that can offer guidance in this area. The reality in many of today’s work environments is that organizations have downsized and some are still struggling to come back from the worst economic recession in recent memory. This has impacted productivity, revenue, employee morale, customer perceptions, and overall societal values. The new business norm is what it is today for many organizations and their employees. The result is that employees and their supervisors are learning to adapt to the changing face of customers related to their needs, wants, and expectations. That means that you on an individual level must step back and analyze your job and role in the service culture so that you can better prepare to meet the challenges and opportunities that you will surely encounter. Look for a strong mentor in your organization. Many organizations have realized that they need to provide succession planning for the future. To do that, they must create a system whereby frontline employees, junior supervisors, and managers or future leaders are guided in their personal and professional development by those with more expertise, tenure, and contacts. This is going to become even more crucial in the future because of the coming “brain drain” in which thousands of older workers will retire and exit the workplace in virtually every industry and type of organization. When they go, they will take decades of experience and knowledge and leave behind a huge gap in many organizations, especially those that have not created an effective exit strategy or prepared others to step into key roles and positions. One viable strategy that some organizations are using is to put into place a strong sponsored and supported mentoring program. If your organization does not have a system in place to pair newer employees in the profession with those more knowledgeable and skilled, try to find someone who is a superior customer service professional and get to know him or her. As your relationship grows, become a sponge and soak up as much of his or her knowledge as possible. Additionally, do an Internet search for professional organizations that cater to your profession (e.g., customer service representatives, call center representatives, sales professionals, or whatever your job title). Often they offer networking opportunities on a regular basis locally where you can attend meetings to hear guest speakers who share their expertise in the field. Through such events, you can likely identify other professionals who are looking to share best practices and information while growing their knowledge and skills. Avoid complacency. Anyone can go to work and just do what he or she is told. The people who excel, especially in a service environment, are the ones who constantly strive for improvement and look for opportunities to grow professionally. They also take responsibility or ownership for service situations. Take the time to think about the systems, policies, and procedures in place in your organization. Can they be improved? How? Now take that information or awareness and make recommendations for improvements. Even though managers have a key role, the implementation and success of cultural initiatives (practices or actions taken by the organization) rest with you, the frontline employee. You are the one who interacts directly with a customer and often determines the outcome of the contact. Some people might throw up their hands and say, “It wasn’t my fault,” “Nobody else cares; why should I,” or “I give up.” A special person looks for ways around roadblocks in order to provide quality service for customers. The fact that others are not doing their job does not excuse you from doing yours. You are being paid a salary to accomplish specific job tasks. Do them with gusto and pride. Your customers expect no less. You and your customers will reap the rewards of your efforts and initiative. Like many other aspects of your job, customer satisfaction and retention often depends on how well you do your job. By taking personal pride in what you do and striving to achieve the best possible outcome of any task you begin, you can help ensure a sense of personal pride. At the same time, you initiative and efforts will likely be recognized and rewarded at some point. 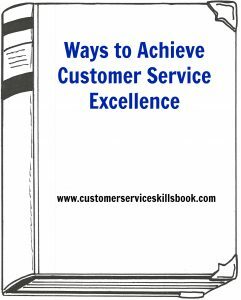 For additional idea and strategies on ways to achieve customer service excellence, search this website for related articles. Also, check out Please Every Customer: Delivering Stellar Customer Service Across Cultures and Customer Service Skills for Success. Do you have personal service improvement strategies that have worked well for you that you are willing to share with others? Offer one here. This entry was posted in Customer Service, delivering excellent customer service and tagged Achieving customer service excellence, Excellent customer service through professional development, Ways to Achieve Customer Service Excellence. Bookmark the permalink.